Bobbie Houston questions the integrity of the Royal Commission? 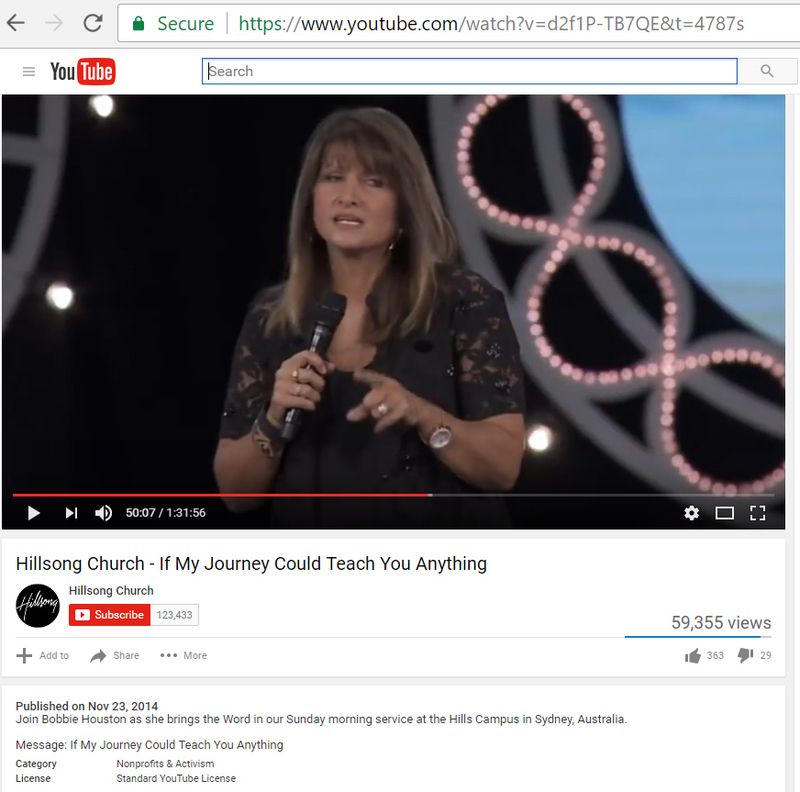 Home › Hillsong › Bobbie Houston questions the integrity of the Royal Commission? As we look at a sermon preached by Bobbie Houston back in November 2014, where the focus of her message was on her children (not Jesus), Bobbie Houston also brought up the topic of the Royal Commission, TWICE accusing them of being “unfair”and “assailing the integrity” of her husband and her owning feelings of “defilement”. Bobbie Houston claimed she was talking to herself, her family and those close about the Royal Commission. She revealed from the pulpit that she not only questioned the integrity of the Royal Commission – but has done so on multiple occasions to different people. In other words, although she is defensive of her husband, she has also perpetuated the belief to others that the Royal Commission has been unfairly attacking her husband’s integrity. Bobbie Houston thinks that her husband has integrity. The fact is this: it was revealed at the Royal Commision that Brian Houston covered up the crimes of his father, Frank Houston. Apart from the AOG (and possibly Hillsong elders) knowing of the AHA victim, Brian Houston mislead everyone else into believing that all of Frank’s victims were only in New Zealand. AHA was not. He was Australian. And no one knew about the correspondence between AHA, Frank Houston and Brian Houston. It was only at the Royal Commission (thanks to the victims and those that stood with them), that it was revealed that Bobbie Houston’s husband mislead not only the AOG Executive, not only Hillsong church but the general public over the crimes of Frank Houston, specifically in covering up one victim trying to get justice through the AOG and CLC/Hillsong system. Bobbie Houston attacks the integrity of the Royal Commission in her attempt to defend the unethical behavior of her husband. So in truth it was the integrity of the Royal Commission that was being “assailed” by Bobbie Houston when she claimed that her “husband’s integrity was … [being] … assailed.” He was being rightly exposed for covering up and lying about his involvement with AHA. When Mrs Houston said, “we have to start to pray and take hold of God and actually address the spiritual things”, this is NAR language. Bobbie is misleading people into thinking that there are spiritual forces moving against Hillsong. In fact it is the exact opposite. Let us “actually address the spiritual things” through the writings of the Holy Spirit in Matthew 7. In Matthew 7, the Holy Spirit that Jesus warns us about wolves in sheep’s clothing. False prophets that come in his name. Jesus appealed to common sense. You don’t find bad fruit on good trees or good fruit on bad trees. And do you know what Jesus called these false prophets that did all these ‘wonderful’ things in his name? In today’s culture, that would mean ‘lawbreaker’. That’s not Jesus name-calling people. He is identifying who and what they truly are. And the ‘lawless ones’ in this case are Brian and Bobbie Houston. a) She felt even more exposed than normal because she had to live with the fact that her husband lied and covered up this information to her. b) Knew of this cover-up and finally felt just as exposed as he did over living with this hidden secret. Nevertheless, her reaction suggests her discomfort in not dealing with this incident properly either back in 1999 or 2014. When she claimed she felt spiritually exposed “as if an enemy was surrounding us to defile us” that should send alarm bells to cult talk. Especially NAR cult talk. For starters, Bobbie Houston considers herself a Apostle/Prophet (she is Hillsong’s spiritual ‘mum’). And as an NAR Apostle/Prophet, the entire Royal Commission situation left her with no power in controlling her people. So she does what the majority of other NAR Apostles/Prophets do: demonize the enemy. She is simply following her husband’s lead (and Frank Houston’s lead). Hillsong is right, their enemy ‘is the devil’. And if Brian Houston is exposed by the Royal Commission for covering up AHA, does that makes them of the ‘devil’? Hillsong leadership is not ignorant. They know the ramifications for covering up paedophilia. They knew full well the dangers they face in continually attacking the integrity of the Royal Commission. What should be the legal consequences of continuing down this road? And if justice is not served, being on the receiving end of the judgment of Jesus Christ?